What Is DA Form 2-1? 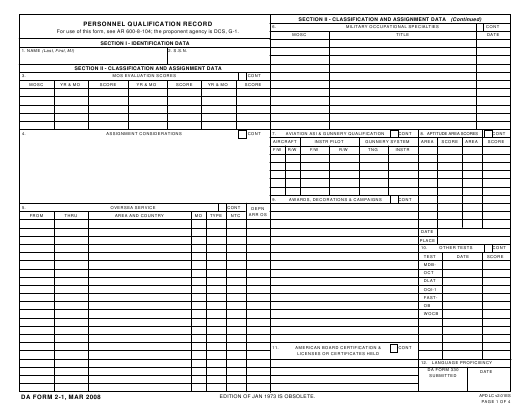 DA Form 2-1, Personnel Qualification Record is a version of a Soldier's individual record brief used for recording assignment and family data and information about service and training. The DA 2-1 - otherwise referred to as the Army Personnel Qualification Record - is kept by the Record Manager and is constantly updated over the course of the Soldier's career. The Department of the Army (DA) released the latest edition of the form - sometimes confused with the DD Form 2, United States Uniformed Services Identification Card (Reserve, Retired or Reserve Retired) - in March 2008 with all previous editions being obsolete. An up-to-date DA Form 2-1 fillable version is available for digital filing and download below. The DA Form 4037 (Officer Record Brief) is a related form that provides of a one-page summary of the qualifications and career history of Individual Ready Reserve (IRR) Officers, Individual Mobilization Augmentee (IMA) Soldiers, and Warrant Officers. How To Fill Out Da Form 2-1? For use of this form, see AR 600-8-104; the proponent agency is DCS, G-1. EDITION OF JAN 1973 IS OBSOLETE. Additional guidelines and filing information can be found in the AR 600-8-104 (Army Military Human Resource Records Management) released in April 2014. DA Form 2-1 instructions are as follows. Section I requires the Soldier's identification data. Block 1 - Name. Enter the last name, first name, and middle name in capital letters. The maiden name must be entered after the middle name for married female personnel. Block 2 - SSN. Enter the Soldier's social security number with a hyphen after the third and fifth digits. Section II is for the classification and assignment data. Block 3 - Military Occupational Specialty (MOS) Evaluation Scores. Enter the Military Occupational Specialty Codes (MOSCs), the scores and the year and month of testing. Block 4 - Assignment Considerations. List any medical conditions, physical defects, temporary limitations, conscientious objectors, disabilities, dependents and any other limitations to a possible assignment. Block 5 - Overseas Service. Describe all overseas service performed under the authority of the Department of Defense. Block 6 - Military Occupational Specialities. Enter all current military occupational specialty codes, specialty skill identifiers, and additional skill identifiers. Block 7 - Aviation ASI and Gunnery Qualification. This entry must be left blank. Block 8 - Aptitude Area Scores. This section applies to enlisted personnel only. Block 9 - Awards, Decorations, and Campaigns. List all decorations, service medals, service ribbons, and awards. Record all authorized campaigns in which the Soldier participated. Block 10 - Other Tests. Enter the results of the personnel tests listed in the DA Form 2-1. Block 11 - American Board Certification & Licenses or Certification Held. Enter the title of the board, followed by a dash and the specialty in which the Soldier is certified. Blocks 12 (Language Proficiency) and 13 (Pilot Ratings) are self-explanatory. Block 14 - Flying Status/instrument Certification. No entry is required on the DA Form 2-1. Block 15 - Internships, Residences, and Fellowships. Record all internships, residencies, and fellowships completed at recognized hospitals. Block 16 - Hospital/Teaching Appointments and Private Practice. Described all appointments at hospitals and private practice experience - if any. Block 17 - Civilian Education and Military Schools. List and describe all civilian and military schooling received by the soldier. Section III covers service, training, and other events. Block 18 - Appointment and Reductions. Enter each appointment including integration into the Regular Army. Block 19 - Specialized Training. Record entries for the types of specialized training and instruction listed on the DA 2-1. Blocks 20 (Basic Enlisted Service Date) and 21 (Time Lost) are self-explanatory. Section IV requires certain personal and family data. Block 22 - Physical Status. Specify the findings of the latest medical examination, as determined the examining medical officer. The required information includes the Soldier's height, weight, whether or not the Soldier wears prescription glasses and the date of the medical exam. Block 23 - Place of Birth and Citizenship. Record the data about the place of birth and citizenship status of the Soldier and their spouse - if applicable. Blocks 24 (Number of Dependents), 25 (Home of Record/Address) and 26 (Civilian Occupation) are self-explanatory. Section V is for additional miscellaneous information. Blocks 27 (Remarks) and 28 (Item Continuation Record) are for entering additional entries and providing extra information for the other items on the DA Form 2-1. Section VI is for the Reserve Component data. Blocks 31 and 32 require the Ready Reserve obligation expiration date, Ready Reserve start date, service obligation expiration date, the date of mandatory removal from active status, retirement year ending date, the date of preparing the form and the date of the review. Block 33 - Signature. The Soldier will sign their name with an electronic signature. Section VII requires information about current and previous assignments. Block 34 - Records of Assignments. Current duty assignments are recorded as the initial entry in this item upon conversion of qualification records.